We recently published self-funded research exploring the impact of consumer emotions on the emerging autonomous vehicle (AV) industry—the latest in our ongoing analysis of the relationship between emotion and disruptive technology. As detailed in a previous post, this study revealed many consumers are skeptical of self-driving cars. Further, even the prospect of using this technology generates a negative emotional response. We’ve measured the emotional activation of hundreds of brands in dozens of industries (learn more about our EMPACT approach here) and have found, by far, the autonomous vehicle category generates the most intense and widespread overall negative emotions—indicating a critical obstacle this industry must overcome. Better understanding these emotions can help guide the industry’s marketing efforts and actual customer experiences with this technology. Unlike most industries we analyze, it’s more critical for the AV industry to deactivate negative emotions than it is to activate specific positive emotions, although doing both are obviously important. Anxiety is no surprise here: people fear the prospect of truly letting AI take over and drive the vehicle with no human intervention. People are also concerned self-driving car systems could be hacked, which explains the significant feeling of paranoia—an emotion common in a lot of emerging technology we study. Anything “smart” (i.e., connected to the internet) could be hacked, and there are always people who are more concerned about this than others. Feeling “Hesitant” or “Unsure” also comes up a lot in new and disruptive technology categories. With anything truly new and different, people are unsure of whether it’s ready for primetime, or if they should try it. The emotions around feeling “Hectic” or “Overwhelmed” are more unique to the AV category. It’s so new and potentially transformative that many people simply can’t process the idea of trusting the technology to get them from point A to point B. It’s overwhelming to really think on the complexity of AV systems, not to mention the myriad road scenarios an AI algorithm will need to be trained well enough to react to. Positive emotions are also important to driving mainstream adoption of a disruptive technology. This is a unique challenge for the AV industry because people already have many positive emotions activated when driving their own car. Not surprisingly, the biggest positive emotional gap between driving your own car and the prospect of getting in an autonomous vehicle is feeling in control. The combination of anxiety, paranoia, and losing that feeling of control is a major emotional obstacle to for the autonomous vehicle industry’s path to widespread consumer acceptance. We see this in many AI-driven technology categories where life is increasingly automated and data-driven. This fear of technology running our lives—and the possibility that it might not always do so benevolently—runs deep and has been prominent in popular culture long before the first self-driven test vehicle ever hit the road. There’s also a significant gap between feeling “Secure” and “Protected." As the chart above indicates, people feel a lot more secure and protected when driving their own car, but not so much about self-driving cars. The feeling of insecurity is influencing the high levels of anxiety we see from AVs. The gap in feeling “Efficient/Productive” is also problematic for the AV industry. In most new technology adoption projects where we run this analysis, that emotion emerges as one of the key determinants of more mainstream consumer adoption. People expect disruptive technologies to make them feel more efficient and productive, but if they don’t truly get that feeling when using the technology, they are unlikely to change their existing habits. In addition to a straight gap analysis, we also ran a model to isolate which specific emotions (negative and positive) best predict (on a derived basis) peoples’ willingness to use autonomous vehicles in the future. By far the biggest predictors, not surprisingly, are reducing anxiety and increasing feelings of relaxation. Another emotion that popped in our predictive modelling, which wasn’t evident from the initial data review, was activating emotions around pride. In other words, people who would feel “proud” using an autonomous vehicle are much more likely to actually use one, whereas people who might feel ashamed or embarrassed if their friends or family saw them inside an autonomous vehicle are highly unlikely to hop on board. This “social identity” element is something we see in many new tech adoption studies through our proprietary consumer-centric approach to measuring the impact of identity on decision-making. Does someone identify as being one of those people who uses an autonomous vehicle, or is that for another tribe altogether? Turns out this tribal identity matters quite a bit for new technologies attempting to cross the chasm. Feeling “Secure” and “Efficient” also help predict likelihood to adopt the technology, but as we saw earlier, not many people feel these emotions when they think about using an autonomous vehicle. In my next article, I will share some thoughts and findings from this study on potential paths forward for the industry to overcome these obstacles. You’ll get to see the results when I attempt to play an Ad Man and convince people to reconsider the category. Although it was a humbling experiment, it did reveal additional insights that can help actual creative teams with briefs that include different value propositions linked to specific emotions the industry needs to address. *Sorry again! The puns are just too good to pass up in this blog series. We attend conferences to meet colleagues, present our latest and greatest, and learn more about new methodologies and approaches. 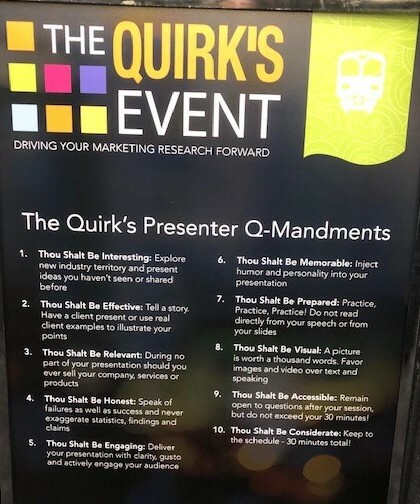 I’m just back from this week’s Quirk’s Chicago Event with its top of the line content, and I’m ready to recap some memorable moments from the conference. Walgreens and Verve presented “Big Data and Small Qual: Amazing Best Friends.” Andrea Golightly presented the evaluation of MedExpress (Key Research question: Is MedExpress a good complement to work with Walgreens Pharmacy?) In the big data phase, they assessed how a partnership would affect equity, traffic, and sales at Walgreens. They reviewed scanner, panel, social media, day parts, categories, and customer cohorts to size the opportunity. The findings yielded that they generally met expectations. Next, stakeholders asked: why isn’t the prediction even better? They conducted “small qual” through their Verve panel. Through open-ended online qual, they found consumers noticed the parking lot was busier than usual, so they'd drive past the Walgreens/MedExpress. Mark Garratt from In4mation Insights spoke about how companies need to use Social Media Data to predict new product success. He explained that social data projects take >1M unique posts to predict sales if they can align the words, sentiment and the motives. For example, to sell vegan organic food, a company needs to see certain tipping points of particular words, sentiments, images and motives. Nestlé talked about applying agile principles to achieve product innovation success. In this presentation, Dawn Ferfolia, Innovation at Nestlé, and Molly Wright, from GutCheck, talked about how they used flexible agile solutions to drive faster time to market, spur collaboration, and drive iteration, reflection and optimization. We even tasted a product, a chilled power bar that resulted from this pipeline change. Joel Benenson spoke on how the rules from the political war room can also be applicable to brands. The presentation clearly described how vital it was to stay on point. First, it’s essential to know what the campaign is really about. He went on to say that for politics and for brands, our greatest strength is usually our greatest weakness. We need to understand our competitive framework, that values matter (ours and theirs), and we need to have principles before policies. He said if we want to position ourselves, it’s critical to know it’s about more than just a horse race. Winning brands and winning leaders define winning on our terms; and we know the voters we need to win. His research delved deeply into the attitudes and beliefs of the base. Jonathan Williams from Discover.ai talked about how brands can use AI on more open-ended tasks (vs. close ended, rule based, logical questions such as “Why do people like chess and how do we get more people to play”). As a proof point, he explained how they helped DeBeers use research to reinvigorate diamonds as symbols of love in today's world. Although diamonds are forever, they are losing to other luxuries as a category among Millennial and Gen Z. This research yielded 15 springboards or hunting grounds, including the notion that diamonds are a sign of commitment, creating a wow moment, and being responsible, ethical, and earthy, etc. Modeling the many paths to purchase to improve marketing efficacy involves delving into the adjacent field of biology for LRW. They’ve used a DNA sequencing-like statistical analysis to figure out similarities and differences between journeys. Much like a small change can drive the DNA sequence to create a frog vs. a bird, the sequencing helps differentiate the journey. Once journeys are established, they create profiles. In a case study they presented (brand was omitted), LRW found seven fundamental journey groupings (price driven, relationship driven, website driven, offer driven, location driven, digital driven, security driven) and tied these to economic potential and the messaging most likely to drive intended behaviors. We learned about the three phases of data democratization from Debbie Fischer of AFI and Kristi Zuhlke CEO of KnowledgeHound. According to them, data democratization means making data and insights available to the broader organization. Millennials make up 35% of the nation’s workforce and expect to Google or use something like Knowledgehound to figure things out on their own. AFI says they’re growing from data adolescence to data maturity and encourage others to “cross over”. RealEyes and EmotionAI work with Sunil Soman from Warner Entertainment. Together they conducted a branded content study of 20 videos and 20 thirty-second ads. They analyzed videos through both passive measures like attention (volume and quality) and emotion (feelings), and active measures such as sentiment (automated analysis of response after viewing content) and survey (ask specific pre- and post to gain extra layer of insight). This work helped guide more relevant advertising targeting. Finally, their goal was ultimately to help create and distribute meaningful content. Insights Strategy Group presented on why Gen Y and Z value happiness, friendship, money, being well-liked and dating. These age groups strive to have enough money to live the lifestyle they want to live, find a job they actually like, and express feeling helpless about what’s going on in the world. Both Gen Y and Z report happiness as their number one goal, unchanged from 2013 to 2019. They also report a 27% decline in valuing being well-liked and a 39% drop in valuing who they are dating/married to as they aged from 2013 to 2019. And of course, it’s not all about the presentations. CMB sponsored the Exhibitor’s Lounge to help provide our market research and insights industry peers with a place to work, eat, rest and talk during the conference. There, and in booth city, we met and reconnected with suppliers, friends, colleagues and partners. What were some of your highlights from Quirk's Chicago? Let us know in the comments below! Like many people, my relationship with technology is complicated, and when it comes to the increasing level of automation in cars, leading us—potentially—towards a future where many vehicles will be fully autonomous (i.e., no human drivers), it gets REALLY complicated. On one hand, the closest I’ve come to dying was in 1993 at the hands of a faulty after-market cruise control mechanism that terminally accelerated the vehicle I was driving (this is actually a thing, apparently). My sudden panic on the highway precluded a rational decision to put the car in neutral, turn the engine off altogether, and/or use the emergency brake. As we entered the highway off-ramp at 70 mph (brake on the floor) my girlfriend pulled an incredible Dukes-of-Hazzard style 90-degree spin turn that brought the car to heel, and ultimately, a miraculous stop. I went on to marry that girl, of course. Never, ever, using cruise controls. Ever. Twenty-five years of significant technological advancements later, lots of people now share my emotional anxiety towards vehicular automation. A new self-funded study we conducted indicates a rumbling emotional backlash towards autonomous vehicle (AV) technology. This is part of an ongoing proprietary analysis of the human emotional dimensions around disruptive emerging technologies, including virtual assistants and smart home technology. The high-level results reveal a very steep path ahead for the AV industry in its journey to gaining widespread consumer acceptance. …and only 10% or so actively “accept” any of these scenarios. Interestingly, the prospect of putting an elderly relative into an AV alone was even worse than the thought of one’s child riding solo. Understanding the emotional landscape behind these attitudes (i.e., how people feel about these scenarios) helps explain why. Consumers react more negatively to autonomous vehicle-related scenarios than any other traditional or emerging category or brand we’ve tested to date. 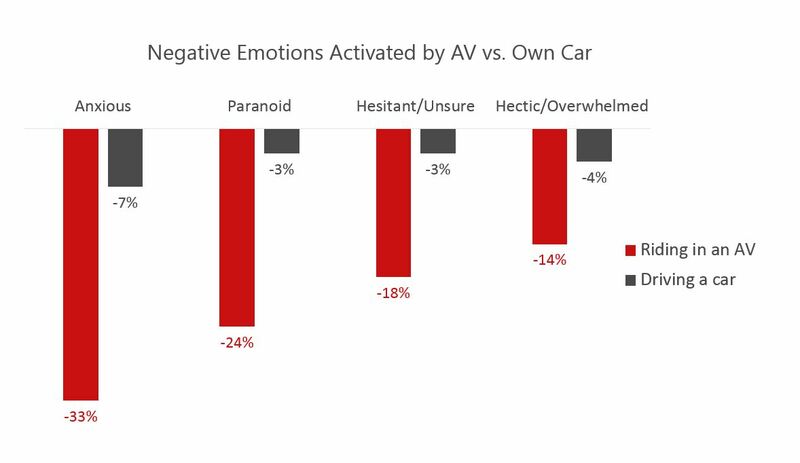 We’ve analyzed hundreds of brands across dozens of categories and have found, by far, AVs evoke the highest “net negative emotions”—a combination of valence (how bad) and activation (low to high energy). If hopping in an AV yourself, the net negative emotional activation is -18%—over 3x the net negative emotions generated from driving your own car. This came as a surprise considering plenty of our sample is from major urban areas where traffic continues its relentless march towards Sheer Awfulness. The prospect of having an autonomous vehicle, say, drive your kid to soccer practice on its own, fares even worse with a -27% net negative activation. Although there are plenty of obvious benefits to autonomous vehicles, many people are still wary of this technology as it currently generates only ~12-16% net positive emotional activation compared to the ~42% generated by traditional driving. And when compared to other emerging or disruptive technology categories like smart homes, autonomous vehicles also have a bigger emotional chasm to cross. 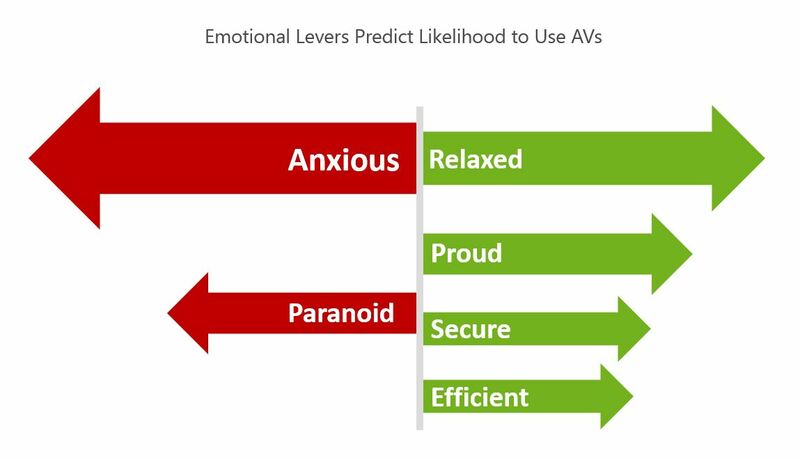 Smart Homes, for instance, do have a problem with not activating enough positive emotions (i.e., many people don’t “get” or feel the benefit of them), but at least they don’t have a major negative emotional barrier to overcome like AVs. To learn more, join me on April 2nd at 2pm ET (11am PT). On April 2, I'll be hosting a brief webinar diving into the details of the specific negative and positive emotions that will be key to driving broader acceptance. I’ll also cover an analysis of messaging that resonates with various consumer segments—uncovering what will compel/deter someone from considering this technology. Join me for the ride (sorry), I promise it will be interesting, useful and entertaining. Chris Neal is CMB's VP of Tech and Telecom research who recently made strides towards his reconsideration of autonomous vehicles while on a road trip with his son. How will we incorporate behavioral analytics into our work this year and beyond? Chatting with Netquest at their booth or listening to Jay Steffey speak about Amazon customer behavior would’ve told you passive metering has come a long way in the last two years. Suppliers have begun consolidating (e.g., Netquest bought Wakoopa) to increase their offerings and give clients a clearer picture of what their consumers are doing. For example, DISQO (formerly Active Measure) has an unprecedented panel of about 150,000 desktops that provide real insight into consumers’ digital behaviors. From event-focused metrics (e.g., product search, view, ad exposure, etc.) to sub-events (e.g., add to cart), DISQO taps into consumer behavior at scale. Whether you’re in FMCG or the financial services industry, combining survey data (what someone reports they did) and behavioral data (what they actually did) provides a new and exquisite area for interpretation—a more holistic view of what your customers are doing and why. Are we evolving beyond traditional starting points in studying consumer identity? Understanding consumer identity is critical to unlocking key insights and Millennials and Gen Z are helping us evolve beyond traditional modes of thinking about identity. Julie Arbit of VICE Media and Ally Aleman of Insights Strategy Group shared insights from a deep dive into Gen Z—a generation living in a world of constant choice thanks to technology. This inundation of choice impacts their identity, passions, careers, and relationships. As society moves towards acceptance of gender identity as non-binary and Gen Z’s values and beliefs diverge from traditional concepts (e.g., family, “9 to 5” job), how will your brand fare in 2019 and beyond? How will we be (and stay) agile at our companies? Agile was another hot topic at The Quirk’s Event. While companies have their own interpretations and implementations of agile, fundamentally this approach can help brands keep pace with changing consumer behaviors. Companies like Verizon and DellEMC—who are in highly disruptive and everchanging industries—can get smart and iterative insights at quick speed. DellEMC’s Stephanie Woodstrom, Dynata’s Zahara Malik, and Verizon all shared how implementing agile gets them fast reads on promotional offerings, products, and more. It’s important to note, though, that agile methods don’t mean sacrificing data integrity for speed. It’s about being smarter and doing things in an iterative way, so it becomes turnkey and efficient. 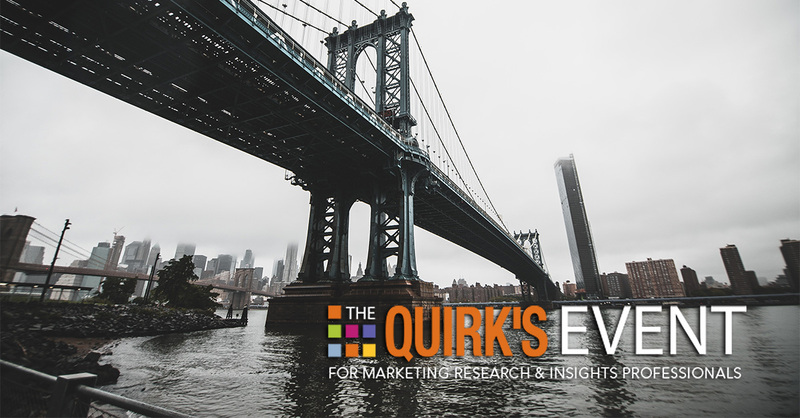 What was your favorite session at Quirk’s Brooklyn? Most inspiring speaker? What are your “must sees” for Quirk’s Chicago next month? Comment below! As brands expand into developing markets, the need to gather opinions of local consumers has increased in kind. To get accurate information and responses, it’s common practice to translate surveys into local languages when conducting international research. However, all too often the quality of the translation can make or break the success (and accuracy) of research results. Many years ago, at a previous company, one of my clients, a leading athletic apparel company, conducted a seven-country global study to segment their consumers and understand underlying brand perceptions. One of the key perceptions we explored was the notion that the brand had “sold out”, which in the US means no longer being true to oneself or one’s heritage. During analysis, I couldn’t understand why some of the countries highly agreed with this metric, as expected, while other countries (e.g., Germany and China) completely disagreed. Looking at the translated questionnaire, I quickly realized why. Our conceptual term “sold out” was literally translated as “sold out”, as in, out-of-stock or not available in stores. A complete disconnect from what we originally meant. 1. Choose your words carefully. A successful translation begins with the chosen English words. Avoid colloquialisms, expressions, and any words or phrases that may have multiple meanings. For example, idioms and other phrases “cash cow”, “standing engagement”, or “hangout” may seem innocuous, but could have very different meanings if translated literally into other languages. Read the questionnaire out loud and think critically about what's being said. If anything has the potential to be misconstrued, select different English words to express your meaning. 2. Conduct a conceptual or content translation, not a literal translation. This approach looks beyond the actual written words and instead focuses on the original intent or objective. 3. Encourage your client to ask a local colleague to review the translation. If your client is an international brand, they likely have global colleagues. If so, encourage your client to ask a local colleague in the country where research is being conducted to carefully review the translation. This will also help ensure any messaging or industry-specific terminology has been captured properly. Be sure to provide the English version along with the translated version so the translation is being reviewed in the English context. 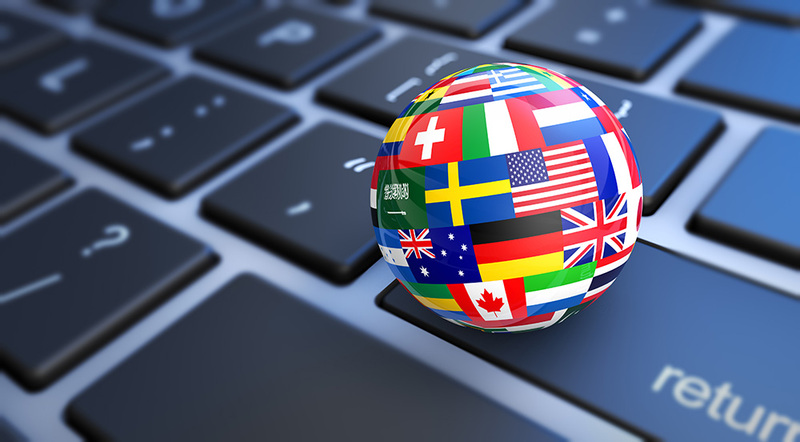 If no local colleague is available, translation services can usually offer an independent translator to review the document or conduct a back-translation (the questionnaire document is translated back to English). The latter is often more expensive but can be well worth the investment as opposed to getting unusable data. 4. Remain engaged throughout the entire translation process. As the researcher, you are most familiar with the project objectives, so it's critical you work closely with the translator to ensure nothing is overlooked or skipped in the translated questionnaire. Implementing these four simple practices can literally help make your next global research project a success! Carole Hubbard is a Sr. Project Manager at CMB whose travel bucket list includes Ireland, Austria, Tuscany, Greece, and Switzerland.